I read a few, just a few, and chuckled. We in California live in former Mexican territory. And this ad plays on some of the history with a bit ot humor and the Mexican equivalent of “political incorrectness” — it’s silly to get outraged about an ad directed at Mexican vodka drinkers. I did chuckle though. 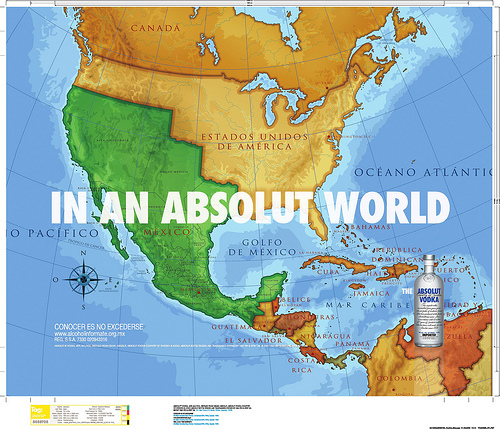 More ads should include maps! Maybe we Americans in particular might learn some history and geography! Joe Crawford blogged this at 5:23am in 2008 in April. The 8th was a Tuesday. You are reading this 11 years later. Comment. There are no comments Tweet. Send email. It has hashtags→ advertising funny politics .